After a week of lost time being sick and feeling rather uncreative, I am back at it and enthusiastically working on several pieces. I just finished a small piece for my TARTS (Textile Arts) group using stamping. They gave us sticky back strips of insulation that I cut up and stuck to a piece of cardboard. They also gave us a piece of moldable foam that you can heat with a heat gun and then press onto a textured object (rubber stamp, metal object, etc.) to make a negative image stamp. I molded the foam on a fatigue mat that has about 1" holes in it, then on some rocks on my back patio area, and on a piece of plastic mesh. The rock stamp was rather interesting and organic enough to be very useful. 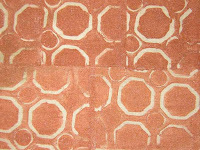 I used brown, rust, and cranberry PRObrite pearl textile paints. 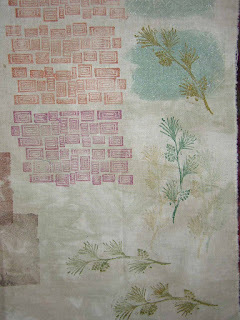 I had just gotten a couple of new rubber stamps so I printed a few things with those directly on the fabric as well (pine needles and multi-squares). They will both be very useful for future projects. I was at first reluctant to cover up a nice piece of hand-dye, but the stamping was very fun and after I gave up on the bright red they gave us in our project kit, I had a lot of fun using my own paints to do the stamping. I did use the bright red on the project I completed and it worked well there, but that and the red mesh stamping was enough of that color for me! The group of women that I get together with every Tuesday morning decided to take a small road trip to Missoula last Friday to see my fiber art exhibit at The Whooping Crones Gallery and I went with them. There were 9 of us and we had a great time. The gallery wasn't open when we got to Missoula so we stopped at a fabric shop called Selvedge Studio which has great unique fabrics and I bought a couple of pieces. 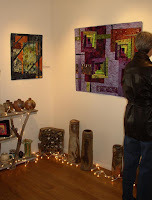 Then we went to the gallery and everyone got a chance to see my quilts hanging with the nice lighting and all in one place. We went to lunch then hit a quilt shop on our way out of town where I bought a few more pieces of fabric, but I got small pieces so I kept it very reasonable on this trip! All in all it was a very nice day and I enjoyed the company of my friends immensely. They are a great group of women and I appreciate that they include me in the group and encourage my efforts in this rather offbeat method of quilting that I do! I am doing the base quilting for my textile arts group challenge piece and then I will be attaching the various elements to it and finishing with possibly some embroidery or beading. I only have a few more weeks to complete it so I'll have to see what I can get done. It will be in the 2nd annual TARTS fiber art show, An Affair of the heART, in Hamilton, Montana over the Valentine's Day weekend, and they will be voted on for prizes. I'm not sure mine is going to be worthy of a prize, but it will be interesting nonetheless. I have figured out how to use all of the elements they gave us without making it look to cluttered I think. I finally pieced together a backing for the brown tree piece I was working on numerous posts ago, and I am ready to layer it and get to the quilting. I think as soon as I get the challenge piece together that will be my next effort. I think it will be a fun one to quilt, although as usual I probably won't know what to quilt on it until I choose a thread, put it under the needle and give it a go! I have been trying to meet several deadlines lately and it seems to be a much more difficult way for me to work than if I am just inspired to do something. I did throw in one project that was just an inspired piece and I have completed a portion of it. I did a small 4"x6" piece completely with handwork, and I will be mounting it on a stretched canvas if I can figure out how to do that so it looks good---a new style for me. I had picked up a couple of inexpensive canvases with this in mind and this piece seemed to call for that type of finish. I just finished making two 5"x5" pieces at the request of a guild member who is doing the program for our guild meeting this month on using recycled/repurposed materials in quilting. I used scraps, buttons from my days of sewing clothes, objects found in nature, old silk threads that I had received from a friend when her mother died, and a piece of jewelry. It was fun to challenge myself to not use anything new. I even pieced together batting scraps! The piece I am working on for our textile arts (TARTs) group challenge has gone through somewhat of a metamorphosis since it was just not getting anywhere. I changed the background fabric, trimmed up some of the pieces I had planned to overlay onto it, and did some painting on some of the objects. I am having a hard time working in all of the 25 items we were given without having it appear busy and chaotic. It is definitely better now and when I walk into my workroom it catches my eye and definitely has some potential now. Before I just plain didn't like it. I went with a much bolder background which definitely kicks up the interest level of the piece. My goal is to try to use all but one item on the front of the quilt. There are a couple of items that are making this difficult, but if I can just get myself to use smaller amounts of things and cut things up it will all work out. When you only have one of something it makes you a little bit nervous to whack into them! 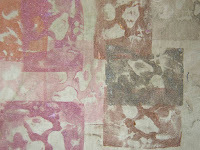 I also need to work on my project for my next textile arts monthly meeting which is next week. We are to use a stamping technique this time and I have done some of the stamping and chosen some fabrics to create a piece, but so far nothing has come together for me. I think this will be a small one since I have so much going on right now. I'm thinking of using a juvenile cowboy print I have with the same red as the paint I used to stamp, so it might be of a bit different style then what I have been creating recently. My design wall is just not big enough to hold all these simultaneous projects. Of course if I got all of the extraneous "stuff" off it and out from in front of it maybe I could use more of it! Looking forward to stopping into the gallery this week and seeing if there has been any interest in my pieces this past week. As I sit at the computer the sky above is blue and the sun is shining in the window. After several days of snow it is really nice to see and feel the sun. I'm working on a challenge piece for a fiber art show in February. It has a lot of pink in it and that is not one of my frequently used colors so thus begins the "challenge". We received a bag of stuff and are required to use everything in the bag in some way. I'm trying to be somewhat imaginative in how I use things and not make a piece that is too busy or too crowded with stuff. I think the key is to not add too much other stuff and try to repeat things in different parts of the quilt. That gives some balance to the piece instead of just having one of each thing scattered all over. There are some rather unique objects in the bag such as poker chips, cupcake liners with hearts on them, a piece of screen, paperclips, and a tea bag. You can use the pieces in any way you want. That leaves it open for using an item to stamp paint onto the fabric or paint over it or cut it up or cover it with fabric or…. whatever! I am enjoying the process and hopefully I can come up with something that will be up to snuff with what I know will be a group of beautiful, creative pieces from the other participants. Can't show any pictures, as I want to keep it under cover! Had my gallery opening last night and I think it went very well. There was a steady stream of people coming and going for most of the three hours. After 7:30 it dropped off completely so we left a little early. I was pleased to see quite a few people that my mom and I had invited, and they seemed to enjoy the show. I had a great time answering questions and talking about my work. Of course the compliments are a great ego boost and a good motivator for me! Hopefully the gallery will continue to have traffic from the many people that I have notified about the show. The goal is ultimately to sell my work, but just having people come and see it who would not usually see it is really a fulfilling thing. 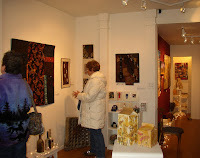 The pieces look great in the gallery and the owner did a wonderful job of hanging them so they are featured very nicely. 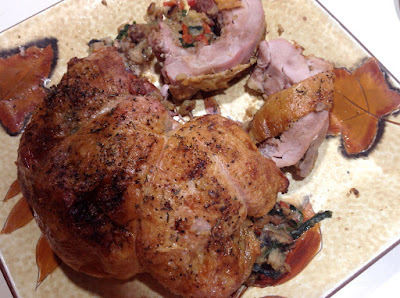 There are fourteen pieces. I feel so fortunate to have this opportunity to show my work.